OXFORD, Miss. – For the first time, scientists have observed ripples in the fabric of space-time called gravitational waves, arriving at the earth from a cataclysmic event in the distant universe. This confirms a major prediction of Albert Einstein’s 1915 general theory of relativity and opens an unprecedented new window onto the cosmos. The gravitational waves were detected at 4:51 a.m. Sept. 14, 2015 by both of the twin Laser Interferometer Gravitational-wave Observatory detectors in Livingston, Louisiana, and Hanford, Washington. The LIGO Observatories are funded by the National Science Foundation and were conceived, built and are operated by the California Institute of Technology and Massachusetts Institute of Technology. The discovery, accepted for publication in the journal Physical Review Letters, was made by the LIGO Scientific Collaboration, which includes the GEO Collaboration and the Australian Consortium for Interferometric Gravitational Astronomy, and the Virgo Collaboration using data from the two LIGO detectors. The black holes collided with each other at nearly half the speed of light, said Katherine Dooley, UM assistant professor of physics and astronomy and senior member of the LIGO Scientific Collaboration. LIGO research is carried out by the LIGO Scientific Collaboration, a group of more than 1,000 scientists from universities around the United States and in 14 other countries. More than 90 universities and research institutes in the LSC develop detector technology and analyze data; approximately 250 students are strong contributing members of the collaboration. UM has been a member of the LIGO Scientific Collaboration since 2007. Cavaglià founded the group at UM and has contributed to understanding artifacts of the instrument data that come from sources other than gravitational waves, a critical component for being able to positively identify a gravitational wave signal. Since 2012, Cavaglià has served as the collaboration’s assistant spokesperson. Dooley joined UM this past fall after having worked for over nine years on building and improving the LIGO and GEO600 detectors. The detectors use laser light to measure infinitesimal changes in the distance between mirrors mounted 2-1/2 miles (4 kilometers) apart. “The detected gravitational waves changed this distance by one-billionth of a billionth of a meter, about one-thousandth the diameter of a proton,” Dooley said. She designed techniques to control the angular pointing of the laser beam, helping push the limits of the precision measurement technology that was needed to make this detection possible. Cavaglià, Dooley, UM post-doctoral research assistant Shivaraj Kandhasamy and three doctoral students from the UM-LIGO team are among the authors of the discovery paper. The UM LIGO team also includes a master’s student, an undergraduate and three undergraduate exchange students from Italy. The entire university community shares in the excitement of this extraordinary achievement, UM Chancellor Jeffrey S. Vitter said. The discovery was made possible by the enhanced capabilities of Advanced LIGO, a major upgrade that increases the sensitivity of the instruments, compared to the first-generation LIGO detectors, enabling a large increase in the volume of the universe probed – and the discovery of gravitational waves during its first observation run. LIGO was originally proposed as a means of detecting these gravitational waves in the 1980s by Rainer Weiss, MIT professor emeritus of physics; Kip Thorne, Caltech’s Richard P. Feynman Professor Emeritus of Theoretical Physics; and Ronald Drever, Caltech professor emeritus of physics. The LSC detector network includes the LIGO interferometers and the GEO600 detector. The GEO team includes scientists at the Max Planck Institute for Gravitational Physics (Albert Einstein Institute), Leibniz Universität Hannover, along with partners at the University of Glasgow, Cardiff University, the University of Birmingham, other universities in the United Kingdom and the University of the Balearic Islands in Spain. Several of the key technologies that made Advanced LIGO so much more sensitive have been developed and tested by the German UK GEO collaboration. Significant computer resources have been contributed by the AEI Hannover Atlas Cluster, the LIGO Laboratory, Syracuse University and the University of Wisconsin at Milwaukee. Several universities designed, built and tested key components for Advanced LIGO: The Australian National University, the University of Adelaide, the University of Florida, Stanford University, Columbia University in New York and Louisiana State University. Virgo research is carried out by the Virgo Collaboration, consisting of more than 250 physicists and engineers belonging to 19 different European research groups: six from Centre National de la Recherche Scientifique in France; eight from the Istituto Nazionale di Fisica Nucleare in Italy; two in The Netherlands with Nikhef; the Wigner RCP in Hungary; the POLGRAW group in Poland and the European Gravitational Observatory, the laboratory hosting the Virgo detector near Pisa in Italy. 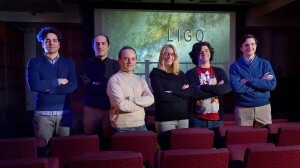 For more information on the UM LIGO team, go to http://ligo.phy.olemiss.edu/.